My daughter, Joey, absolutely loves the Lalaloopsy dolls. 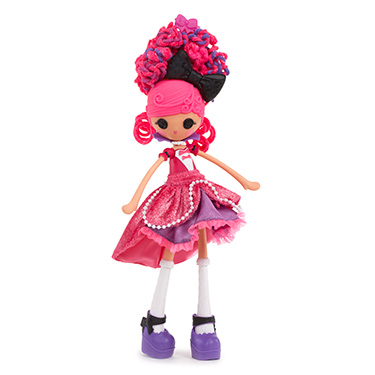 So we were thrilled when we received the newest doll, Confetti Carnivale from the Lalaloopsy Crazy Hair Doll collection. We've had her for the last few weeks and she has had so much fun with her. Confetti Carnivale is one of four dolls from the Lalaloopsy Crazy Hair Dolls collection, there's also, Jewel Sparkles, Scoops Waffle Cone and Cinder Slippers doll. With the crazy hair dolls you can style their hair: cut it, grow it and curl it. Confettie Carnivale came with two hair clips, a curling wand, glitter gel and many colourful hair extensions. She has a beautiful dress and removable shoes. This is hours of fun for any Lalaloopsy fan! Disclosure: All opinions are my own. I received Lalaloopsy Girls Crazy Hair Confetti Carnivale Doll at no cost for the purpose of this review. No other compensation was received.